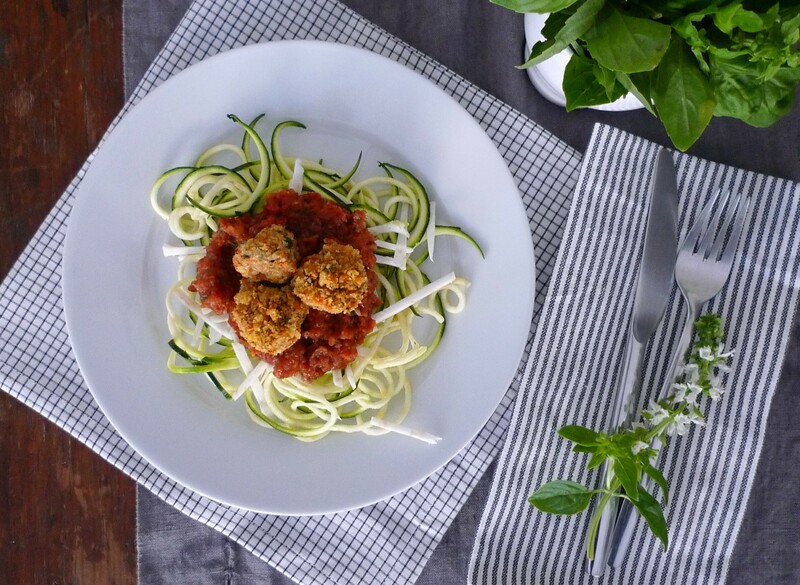 This recipe has been adapted from the Spaghetti and Veggie Ball recipe from the amazing Wholehearted Eats website. I love Sophie’s attention to healthy and wholesome, plant-based eating, and her photographs are so simple and beautiful. Her site is often one I visit for PKU recipe inspiration. When I first came across this recipe, I knew right away that it could be adapted for a PKU diet and was so eager to try. I am always in search of amazing meals that we can all have together as a family, and this is one of them. The protein content found in traditional grain pastas is too high for a PKU diet and so we have to order a special range of pastas specifically made with the Phenylalanine Amino Acid removed. While I am extremely grateful that such products exist, I love the option of making my own ‘spaghetti’ from vegetables; especially those with little or no protein count. This No-Protein Veggie Ball recipe uses Loprofin flour as it’s bread crumb base. If you want to use this recipe for the whole family, another base option is to replace the Loprofin flour for gluten-free, but check the protein count if you plan on giving it to a PKU member of the family. By using Loprofin, the number of servings allowed can potentially increase. 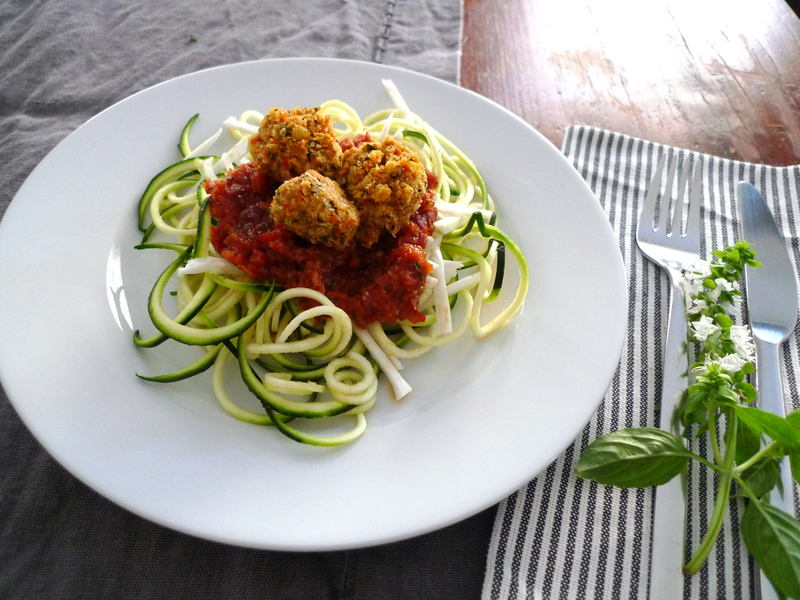 If you want a more complex protein veggie ball, check the Raw Veggie Ball recipe. These No Protein Veggie Balls are so tasty, but check the heat. If you’d like them spicy, add a dried chili to the mix. 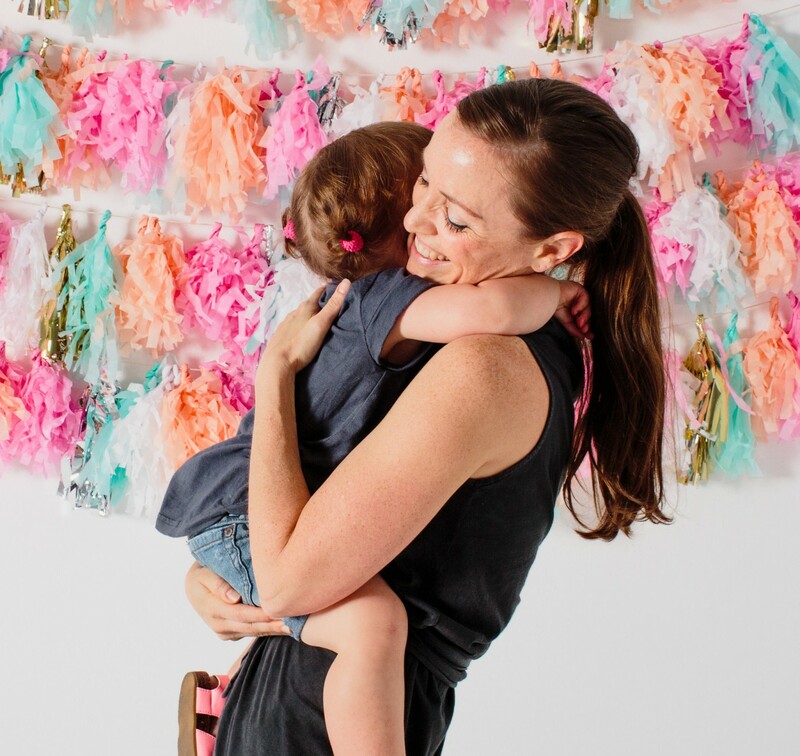 With little ones, this may not be such a good idea. 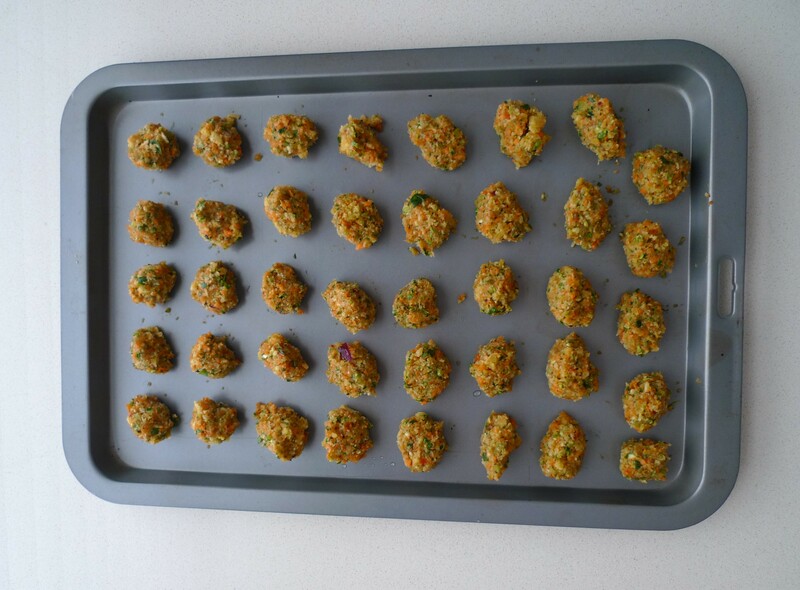 The recipe makes a lot of veggie balls which can easily be stored in the fridge for left overs. We added them to salads or mixed them in with steamed veggies as a type of ‘falafel’. They are also so easy to take on the road as finger foods. Begin by breaking bread into crumbs and set aside. Combine the rest of the ingredients in a food processor or high-speed blender and puree until the mixture is fine, but still chunky. Taste and adjust with salt and pepper if needed. 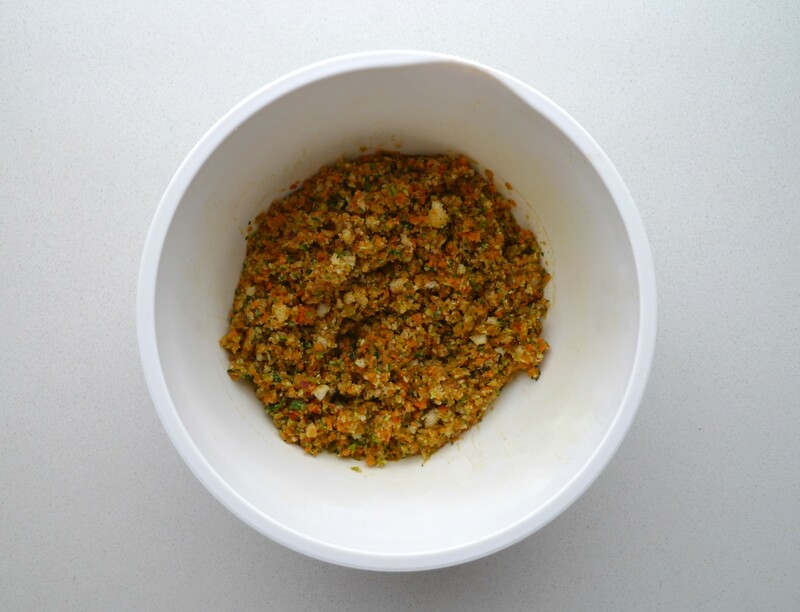 Place the veggie mixture into a small bowl and add the bread crumbs. Work the mixture with your hands; keeping the mixture coarse. Serve with Spaghetti, Sun-dried Tomato Sauce and a drizzle of olive oil. – For low protein diets, use your dietician’s recommended no or low protein flour for bread crumbs (such as Loprofin) to ensure the lowest protein count. – Replace the PKU bread crumbs with gluten-free bread crumbs for non-PKU diets.